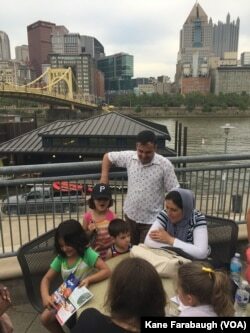 M. Kazam Hashimi and his family, refugees from Afghanistan, attend Hello Neighbor’s Refugee and Immigrant Night at PNC Park, Aug. 1, 2017, with their American mentor Michelle Boehm and her family in Pittsburgh. M. Kazam Hashimi has experienced a series of firsts since leaving Afghanistan: his first American meal; his first American job; and now; his first American baseball game at the home of the Pittsburgh Pirates, PNC Park. Hashimi’s arrival at PNC Park is a welcome but unexpected part of a longer journey fleeing war in Afghanistan, where he worked as a translator for the U.S. Army… a job that became increasingly dangerous. Kazam Hashimi’s arrival at PNC Park, Aug. 1, 2017, is a welcome but unexpected part of a longer journey fleeing war in Afghanistan, where he worked as a translator for the U.S. Army. The park sits on the Allegheny River in Pittsburgh. Granted a special immigration visa during the Obama administration, Hashimi and his family arrived in the U.S. in 2015. Although he spoke English, and had connections with former U.S. military members he served with in Afghanistan, Hashimi was a stranger in a strange land trying to understand a very different culture. The initial 90-day resettlement program for refugees in the United States is filled with activities and appointments that help them find a place to live, a place to work, and initial introductions to American culture. But integration into life in America extends well beyond 90 days, something Pittsburgh native Sloane Davidson realized when she set out to create the “Hello Neighbor” program matching refugee and immigrant families with American mentors in the city. The larger Pittsburgh area has one of the smallest percentages of foreign-born residents in the U.S., and the Jewish Family & Children’s Service of Pittsburgh reports resettlement agencies now place roughly 500 refugees in the city each year. With additional secondary migrants, about 8,000 refugees have arrived in Pittsburgh in the last five years, many of them from Bhutan, Burma, Somalia and Iraq. As Davidson researched support systems in place, she learned that there wasn’t much to help them beyond the 90-day State Department resettlement program. She also learned there were Americans looking for ways to get involved helping newly arrived refugees, but no way to connect with them. “You had refugees and immigrants who typically didn’t have any American friends because their lives are very isolated,” she said. Along with the isolation, Davidson added, were increased challenges adapting to the new environment. Michelle Boehm, a mentor and friend of Kazam Hashimi's family, attend Hello Neighbor’s Refugee and Immigrant Night at PNC Park, a first for the Pittsburgh Pirates baseball organization, Aug. 1, 2017, in Pittsburgh. So she began hosting events like museum tours, picnics and library visits, pairing refugee families with American mentors like Michelle Boehm. Taking in “America’s Favorite Pastime” isn’t just a first for the Hashimis. Davidson says Hello Neighbor’s Refugee and Immigrant Night at PNC Park is also a first for the Pittsburgh Pirates baseball organization, a welcome development in a city she hopes will be more inviting. Michelle Boehm says her family has integrated so well with the Hashimis they are more than mentors … they are friends. Thanks to Hello Neighbor, the city of Pittsburgh has built a bridge into Kazam Hashimi’s heart. “City of Bridges. I love it … it is very friendly,” he said, smiling under his new Pittsburgh Pirates baseball cap. 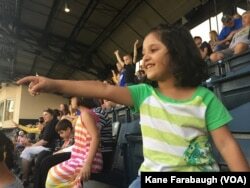 In Afghanistan, people are big fans of soccer not baseball, Kazam Hashimi said, while his children, ages 6, 5 and 3, enjoy their first Major League Baseball game in PNC Park, Aug. 1, 2017, in Pittsburgh. Right now Davidson says there are about 25 refugee families paired with 25 families in Pittsburgh, and that number is growing thanks to encouraging responses by the community to events like the one at PNC Park, which also helps draw in new volunteers. The growing success of the Hello Neighbor program could soon build bridges beyond the Steel City, and may also help the Hashimis mark another first — the first participants in a wider “Hello Neighbor” movement. Davidson is happy to know the idea is catching on, and is encouraged by the growing support for the program locally, which includes a recent $130,000 joint commitment from The Heinz Endowments and the USA for UNHCR to fund the program in Pittsburgh. Kane Farabaugh is the Midwest Correspondent for Voice of America, where since 2008 he has established Voice of America's presence in the heartland of America.